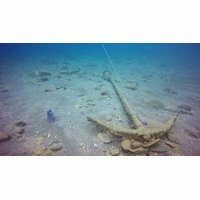 This Roman anchor revives the search for wrecks in the port of Caesarea. In April 2016, Israelis Ran Feinstein and Ofer Raanan accidentally discovered bronze objects while diving in the port of Caesarea in Palestine. They alerted the authorities and other dives allowed to trace many objects of the fourth century AD. Mr. Sharvit, director of the marine unit of the Antiquities Authority, explained this succession of discoveries by the lack of sand at the bottom of the port and the increase in the number of divers on the site. These are the remains of the cargo of a merchant ship apparently carrying metal for recycling. Two agglomerates of coins weighing 20 kilos were reassembled. They are in the image of the Emperor Constantine, who reigned at first on the western part then on all the Roman Empire until his death in 337, and Licinius, his rival who reigned on the eastern part and was defeated in 324. 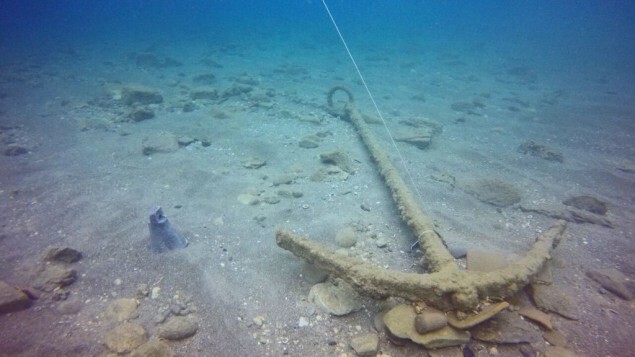 Preliminary analysis of the ship’s iron anchors suggest that the crew attempted to stop the ship before it washed ashore by dropping the anchors into the sea. Their attempts were unsuccessful, however, as the anchors apparently broke due to the high-speed winds and powerful waves they encountered, according to Sharvit and Planer. This anchor make part of these discovers.